← AppleTV and iPad The New Interactive Classroom? Change is difficult. Typically it is most difficult for those that don’t make the decisions for the change. There is a lot of change going on right now in education. Common Core standards driving standardized assessments, pay for performance, and a politically charged focus on education reform can put a lot of stress on the educator. Now add to all this the ubiquitous and constantly evolving webtools that are revolutionizing the way we interact and learn from one another and we have a perfect storm of helplessness inducing paranoia. 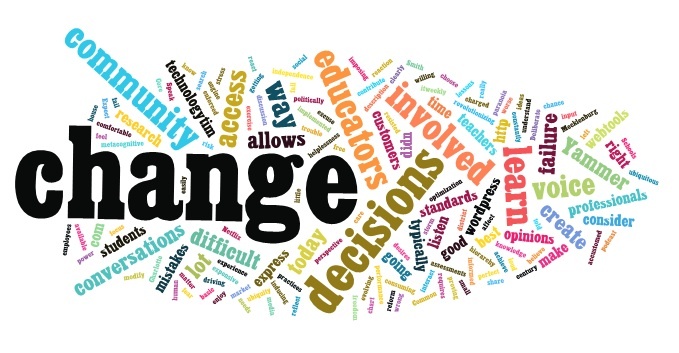 Most educators feel left out of the conversations about change and what they should/could do about it. There is no way around it. Change involves going against what we are accustomed to, comfortable with, and know we enjoy. Deliberate change is a metacognitive exercise that requires us to take a chance and risk failure. But failure is the best way to learn. We learn from our mistakes. The trouble is, educators fear proving they were wrong. Tim Smith and I had a discussion about failure on our podcast here. Consider how you react when you are told you must do something to when you have a conversation and are allowed to express your opinions and give input to the way change is implemented. We are more willing to experience change when we have some say in that change. This is good to consider when imposing change on students too. If we believe we have freedom and independence as a basic human right, then no matter how small, an enforced change is typically resisted. With the webtools available today, there is no excuse for not getting involved. In Charlotte Mecklenburg Schools, we have created a community on Yammer that allows every teacher to have a voice if they choose to. There is no hierarchy or org chart, just conversations involving professionals across the district that allows us to share ideas and communicate the needs of the students, teachers, and community. A good description of how we use Yammer can be found here. The decisions that are made today can be more informed than ever before. The market research of the last century was expensive and time consuming. Today, with a little knowledge of social media, and some best practices in search engine optimization you can achieve for free what would have involved many full time employees. Take the lessons learned from Netflix and HP this fall. They each made decisions that involved change that clearly didn’t reflect the desires of their customers. However, after the decision they were able to see the reaction and it didn’t take a lot of research to understand they made mistakes. They were able to modify their decision because the access to their customers opinions (voice) was easily accessible. Each of us have access to create a voice and contribute to decisions. It is up to us to express our perspective if we really care about changes that affect us. It is up to those with the power to make decisions to listen to that voice. If we are loud enough… they will listen. This entry was posted in 21st Century Skills, edtech, Webtools and tagged change, common core, failure, itweekly, metacognition, pay for performance, technology tim, yammer. Bookmark the permalink.